Since the 2015/16 super El Nino, SSTs in the open waters of the Arctic have been running very much above average. The distribution across the whole Arctic Ocean in both years is surprisingly similar. Circulation patterns, wind direction and strength also make a difference (not shown). The high SSTs with large areas well above the critical level of -1.5c (where sea water starts to freeze) were prevailing in both years. With this and the high 2M surfaces temperatures right now (even higher than in 2016), this may well stall or slow the re-freeze for at least a short period. Unless the surface temps fall back quickly to well below freezing, the 2018 ice build up may continue at similar rates to 2016. The Siberian side is the warmest and that's where the ice extent is so far below average. The Canadian Arctic and Greenland are colder than normal right now and have been for a few weeks and ice accumulation in that part of the Arctic ocean will continue apace. We need to monitor the other side and especially those northern Russian and northern Siberian temperatures. Things may well turn around during November with a sustained faster recovery again. Thankyou for your, as usual, brilliant and informed reply. I thought that your comparison with 2016 was very good, and although I have deleted quite a bit of it, I found it very convincing. 1)The SST's on the Siberian side, a month ago, were higher than those of 2016. Now they are remarkably very similar. 2) Whereas on the Canadian side the SST's were lower this year - and they still are at present. The same is true for the 2M temperatures. With the temperatures showing as -40C in Greenland (much lower than 2016) and those in the central and eastern Arctic still a little bit higher than 2016. Now, I have no problem with agreeing with the demise of the ice over the satellite era. But, this year, I think is somewhat different. At the moment, the ice is way ahead of 2016 on the Canadian side (western side?). The ice extent on the Eastern side was behind, but appears to have caught up (as per the last 2days). The effect is that we more ice extent than 2016, and we seem to be moving further away. As I hope you can see 2018 has accelerated away from 2016 in the last week and a half. Now you are 'expecting' to see a slow down in 2018, (as per 2016), but there are some difference, and so far this month, the rate of acceleration is quite impressive. Now I tend to use 'Maisie' for the very latest updates on ice changes (it gives the daily values by region) and an overall value for the latest 24 hour period.. It shows all types of the ice - and tends to be more accurate on coastal ice than NSIDC products, at this time of year. (Clearly. at this moment ice is freezing both at sea and around the coast) . It therefore tends to 'forewarn' changes in the other products and therefore gives advance 'warning' of what is currently happening. It tends to be more reactive to any current changes. It has consistently had daily ice gains of over 150K Km2 with three of over 200K Km2, over the last 10days, until today, when it dropped to a 40K Km2 gain, mainly because of a 60KKm2 decline in Kara. It has gained 2M Km2 in the last 12 days. Average is normally about 1.2 M Km2. Is the drop in Kara the start of your forecasted slow down? It could be. This year has been an interesting year so far, with the ice refreeze being delayed by the flood of warm air from the Pacific in September, just when the refreeze should have started, So far incursions from the Atlantic have been kept to a minimum. This I believe will be the deciding factor as to whether this year ends up as a 'rebuild' year or not. Note - not a recovery year. I hope that I have not upset people with an attempt at identifying the actual changes that are occurring today. The historical recent past gives cause for concerns, but 'current' is at an interesting stage and could go either way. Edit - I will do a more detailed look at ice thicknesses based upon the DMI charts above, in the next couple of days..
Now, I have no problem with agreeing with the demise of the ice over the satellite era. But, this year, I think is somewhat different. At the moment, the ice is way ahead of 2016 on the Canadian side (western side?). The ice extent on the Eastern side was behind, but appears to have caught up (as per the last 2days). The effect is that we more ice extent than 2016, and we seem to be moving further away. As I hope you can see 2018 has accelerated away from 2016 in the last week and a half. Now you are 'expecting' to see a slow down in 2018, (as per 2016), but there are some difference, and so far this month, the rate of acceleration is quite impressive. Now I tend to use 'Maisie' for the very latest updates on ice changes (it gives the daily values by region) and an overall value for the latest 24 hour period.. It shows all types of the ice - and tends to be more accurate on coastal ice than NSIDC products, at this time of year. (Clearly. at this moment ice is freezing both at sea and around the coast) . It therefore tends to 'forewarn' changes in the other products and therefore gives advance 'warning' of what is currently happening. It tends to be more reactive to any current changes. It has consistently had daily ice gains of over 150K Km2 with three of over 200K Km2, over the last 10days, until today, when it dropped to a 40K Km2 gain, mainly because of a 60KKm2 decline in Kara. It has gained 2M Km2 in the last 12 days. Average is normally about 1.2 M Km2. Is the drop in Kara the start of your forecasted slow down? It could be. This year has been an interesting year so far, with the ice refreeze being delayed by the flood of warm air from the Pacific in September, just when the refreeze should have started, So far incursions from the Atlantic have been kept to a minimum. This I believe will be the deciding factor as to whether this year ends up as a 'rebuild' year or not. Note - not a recovery year. Thank you for your recent update. It's great to have your contributions on this thread and I'm delighted that you are joining me in being a very frequent poster on here. I hope that others will join us too, such as Malcolm @Blessed Weather who has posted a number of times but has other commitments with the stratosphere coming first for him ahead of the Arctic - although the two subjects have a closer than ever relationship these days with Arctic amplification and ice loss perhaps complicating the surface to troposphere and more significantly the troposphere to stratosphere coupling processes (or lack of it at times). I have other weather interests too but this thread will be my number one priority throughout the year. Between us (all) we can ensure that we keep the latest statistics updated. This post is just a short (by my standards that is!) reply to yours as I'm in the middle of preparing my "glacial ice" post which will be ready very late today or tomorrow morning. I accept that 2018 has raced ahead of 2016 during the last couple of days. As I said last time, we can pick from a range of charts and some showed the cross-over less than a week ago and some, like the one you showed just now, show that happening, a few days earlier than that (it looks like October 23rd on yours) and your chart is up to October 27th. Let's look at the October 30th chart produced late yesterday (October 31st chart due in several hours time). I'll use the first one that I referred to last time for consistency. This also has the cross-over with 2016 around October 23rd and shows a week of further rapid recovery for 2018 while 2016 had that pause. Indeed 2018 has now caught up with 2012 which saw that sustained rapid recovery from the record low point in September practically without a pause until the second week in December. In recent years that was unusual and most years have seen periods of rapid recovery with several pauses or even a short setback. Now we can see that 2016 started another spurt from November 1st-12th. Should 2018 have a pause we could be back to square one and neck and neck again with 2016 within a week or so. By which time 2016 had a setback and slight net melt. I am now even more confident that a pause is highly likely (but nothing is certain) within the next few days. I refer you to my post yesterday on the "Countdown to Winter 2018-19" thread. 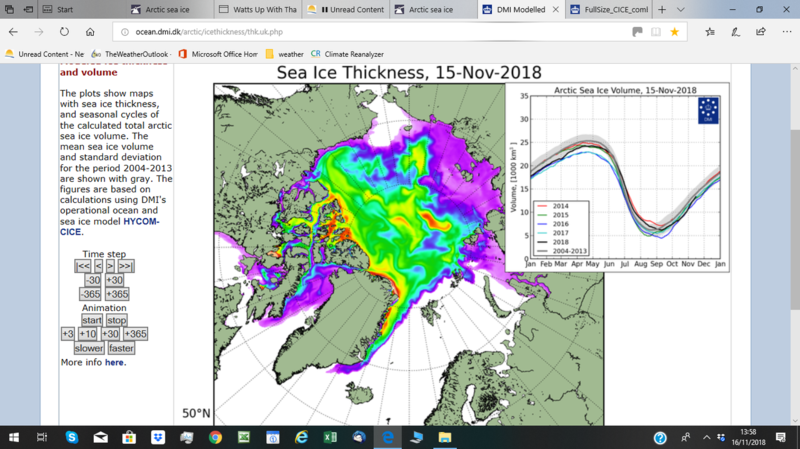 That gave my latest thoughts along with the evidence with snow cover/ice and 2m surface temp charts up to October 30th (SSTs have hardly changed in just 4 days up there). The Pacific side of the Arctic which, unlike some recent years, is perhaps the biggest worry right now has warmed and is predicted to warm further with some 2M temps going above 0c. The Bering Sea has (in recent years) tended to freeze over more quickly than on the Atlantic side (especially the Barents and Kara Seas) as it's more land locked. The powerful typhoon season has produced those anomalously high SSTs in the far north Pacific. 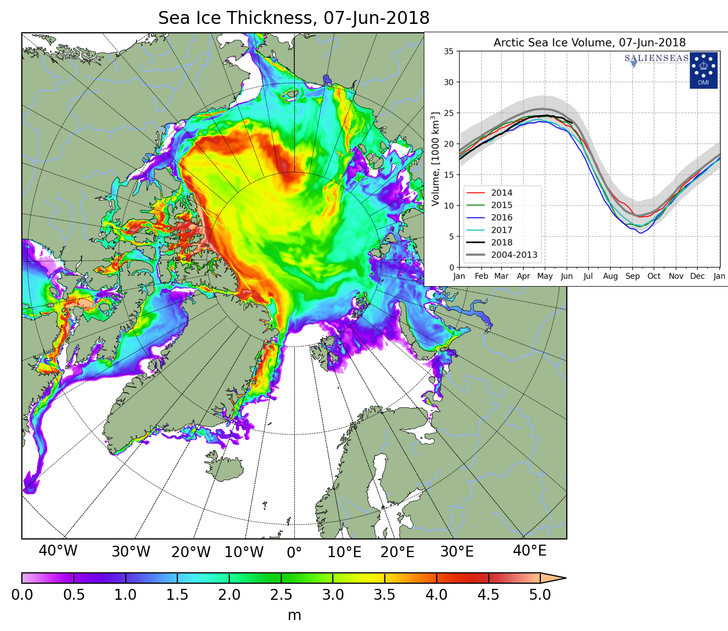 This will definitely restrict ice growth for at least several more weeks there and then, as always, it will largely depend on circulation patterns and the overall distribution of 2M surface temps. I probably also disappointed snow and winter cold hunters on that thread with what I said about the recent Asian snow cover growth in the last few days with something of a setback to come there too. We completely agree on the -ve anomalies over on the Canadian side of the Arctic and over most of Greenland (I've covered that in a number of recent posts and in my Greenland post - all on here). The problem is that the colder areas are already pretty well "iced up" with rather less growth possible. The ice free and open water areas of the Arctic are, unfortunately, mostly where the highest temps are likely to be during at the least the next week or so. 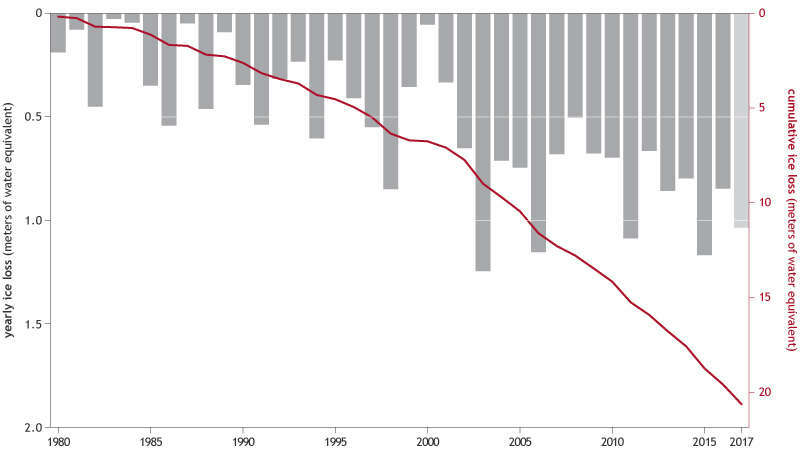 I told Malcolm @Blessed Weather back in August that I intended to do a post on global glacial ice and he posted a useful chart showing the cumulative glacial ice loss since 1980. I show part of his post below but please go to near the bottom of page 1 to find his full post. Well, following a number of distractions on the hurricane, teleconnections and other forum threads (here and in the UK) as well as my more recent posts and updates on here including on Antarctica and Greenland, I am finally getting around to it! We often hear news reports that the world's glaciers are retreating so quickly that most of them will disappear during the course of this century and many within the next 20 to 30 years. Some of this "may" be partly exaggerated by those at one extreme of the global warming and climate change debate and, at the other extreme, climate change deniers might argue that these are temporary or mostly naturally occurring changes. As I've said repeatedly on this thread, I want to endeavour to remove the hype and take a balanced and measured approach, so in this report I want to look at many of the facts about global glacial ice. I will draw data and information from quite a range of sources and this has been much harder than I would have thought. There is such an array of data and some very inconsistent analyses and quite a few misleading charts and statements. There are monitoring sites on many glaciers and ice sheets, satellite data is invaluable and some figures are best estimates based on photographic evidence. Some of these records are quite out of date but I have tried to pull together information based on measurements taken in the last few years but some data goes back to 2006 which I only use for comparison purposes. Therefore I shall include the date (alongside each fact or chart) where ever possible and when it's relevant. Whenever any of us find much more current data in place of the early data I will edit this post so that we can ensure that it is updated. In due course, a full update can be done. I feel that a good way to approach this now will be for me to run through a series of facts and figures which can be discussed in follow up posts by any of us. Please note that in this post I am referring to all "glacial ice" which includes mountain and valley glaciers, tidewater glaciers,, ice caps, ice shelves and ice sheets (including Greenland and Antarctica). About 10 percent of the Earth is covered in "land ice" with glacial ice, including glaciers, ice caps, and the ice sheets of Greenland and Antarctica (NSIDC 2018). This area is covered by about 15 million square kilometers of glacial ice. To be termed a glacier it must be a minimum size of 0.1 square kilometers (or 25 acres). 99% of glacial ice is contained within vast ice sheets (also known as "continental glaciers") in the polar regions. There are about 198,000 glaciers in the world, covering 726,000 square kilometers (June 2017). It is difficult to identify and measure very small glaciers (from snow fields) which are under 0.1 square kilometers, these are called "glacierets". If glacierets are included, the number of glaciers in the World would be around 400,000 but still only 1.4% of the World’s glacierised area. The region with the most ice is the Antarctic and Subantarctic with 14 million square kilometers (including the main ice sheet). The Antarctica ice sheets contains 30 million cubic kilometers of ice or about 90% of the Earth's total ice mass! Antartica glaciers (excluding the main ice sheet) have an estimated 132,000 square kilometers of ice. Second is the Canadian North Arctic with 104,000 square kilometers of glacial ice (excluding the ice caps there). On the other hand, New Zealand has only 1,160 square kilometers of glacial ice. 44% of the World’s "glacierised" area (not sea ice) is in the combined Arctic regions and 18% is in Antarctica and Subantarctica (excluding the main ice sheet). Glaciers (excluding ice sheets etc) cover 0.5% of the Earth’s land surface. The Little Ice Age from about 1550 to 1850 with lower global temperatures than today saw most glaciers and ice sheets expand. The period from 1850 to 1940, saw a warming global climate with a widespread retreat. This was reversed temporarily between 1950 and 1980 as global temperatures cooled slightly. Since 1980, a significant global warming has led to glacier retreat becoming increasingly rapid and some glaciers have disappeared altogether. The glacier retreat into the Rockies, the Andes and the Himalayan ranges has the potential to affect water supplies in those areas. An ice sheet is a mass of glacier ice that covers surrounding terrain and is greater than 50,000 square kilometers and is also known as "continental glacier". The Antarctic ice sheet is effectively a glacier and has existed for at least 40 million years. Smaller glaciers break away from the main ice sheet. 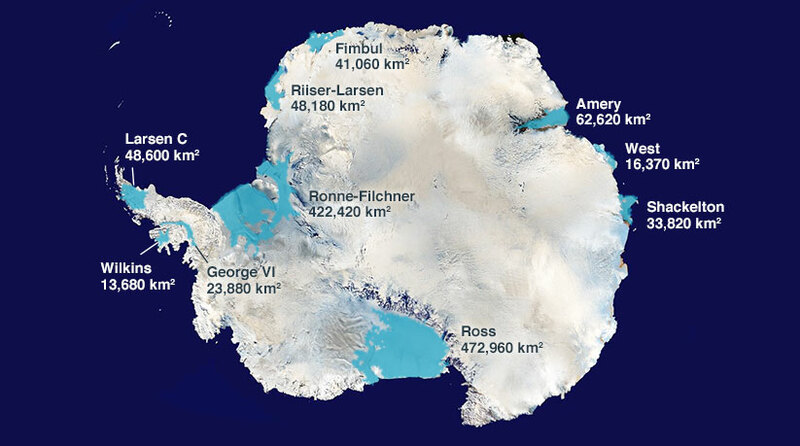 Antarctic ice is up to 3 miles thick in some areas. The largest individual glacier in the world is the Lambert-Fisher Glacier in Antarctica at about 250 miles long and 60 miles wide. Ice Flow Map: This map produced in 2011 shows ice movement in 1996, 2000 & 2006. The colors indicate the speed of the ice flow: purple/red is fast; green is slower. 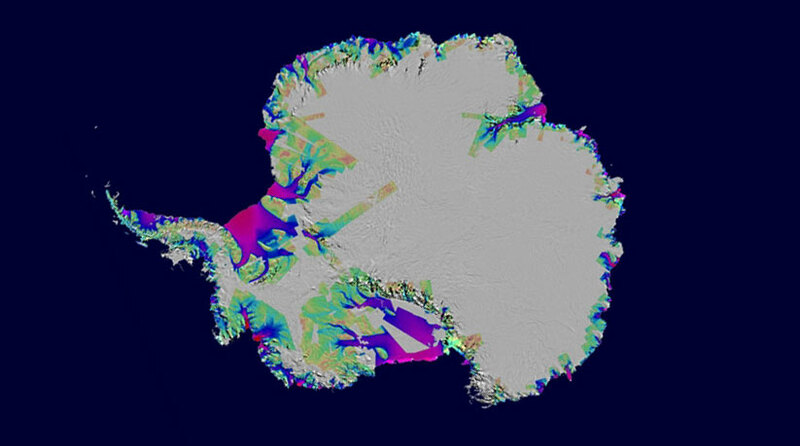 This velocity map is derived from synthetic aperture radar and overlaid on a Moderate Resolution Imaging Spectroradiometer (MODIS) mosaic image of Antarctica. Since 2006 Antarctica has seen increased snowfall and ice gains in some years - with increased ice flow in recent years, we need a later comparison. Antarctic ice velocity in 2015 and the velocity change between 2008 and 2015. The mosaic of the Antarctic ice velocity (2015) from L8 panchromatic images from January 2015 to March 2016 is shown here overlaid on a MODIS mosaic of Antarctica (MOA)34,35. The magnitude of the ice velocity is coloured on a logarithmic scale and overlaid on gridded potential seawater temperature data (PTM) at a depth of 200 m from the World Ocean Circulation Experiment (WOCE). The velocity changes at grounding lines are calculated for 466 glaciers between 2015 and 2008 and are shown for 211 glaciers with high confidence levels (>2 σσ), which are coloured on a logarithmic scale. 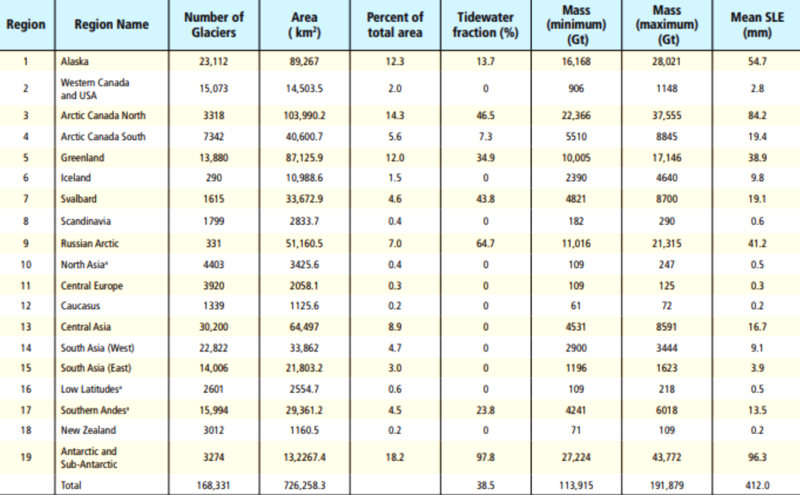 The names of selected glaciers and ice shelves are labelled. ‘A’ through ‘F’ delimits the six oceanic sectors. The details of ice velocity changes along grounding lines are presented in Table S1. The solid grey lines delineate major ice divides. This map was created using The Generic Mapping Tools version. Antarctica's ice velocity is at its highest and accelerating the fastest close to the coast where ice bergs and shelves break off. The Ross Ice Shelf and Ronne Ice Shelf and a few small ice shelves are moving much more quickly than the majority of the land mass ice. 2017 Map: Antarctica has 15 major ice shelf areas, and 10 of the largest appear in this map. Most of these ice shelves are glacier-fed, but ice formed from direct snowfall accumulation is a significant part of all permanent ice shelves. Glaciers usually take centuries to develop but can retreat and melt much more quickly. Ice melt is seasonal and varies considerably from year to year. Once glacial ice begins to break down, the interaction of melt water with the glacier's structure can cause increasingly fast melting and retreat. Glaciers have white surfaces that reflect the sun's rays. As glaciers melt darker surfaces are exposed which absorb heat raising temperatures even more. Greenland's ice sheet has an area of 1.7 million square kilometers, an average thickness of 2.3 kilometers and holds 7 percent of the world's freshwater. If Greenland's glaciers and ice sheet melted completely, global sea level would increase by up to 7 meters (23 feet). This table dates back to 2012 and ice extent figures have changed since then but it does give us a good idea of global ice distribution for comparative purposes. Area-Altitude distributions for each of the RGI regions. The top figure is the distribution of regional glacierised area with altitude. The lower figure is the distribution of normalised area with normalised altitude. The dotted lines are idealised approximations; the triangle is for mountain glaciers, the curved line is for ice caps. Source: Pfeffer et al., 2014. Antarctica has many low-lying tidewater glaciers near the coast has a large amount of low-lying ice. In contrast the North Canadian Arctic has many ice caps on high-elevation plateaus. The distribution of glacier area with altitude is important, as it means that different areas will respond to climate change in very different ways. Glaciers store about 75 percent of the world's fresh water. If all land ice melted, sea level would rise approximately 70 meters (230 feet) worldwide. During the maximum point of the last ice age, glaciers covered about 32 percent of the total land area. North America's longest glacier is the Bering Glacier in Alaska, measuring 190 kilometers (118 miles) long and the ice covers nearly 2,000 square miles. Not all glaciers are declining; in some areas global warming produces much higher snowfall and this can exceed the ice melt or loss - the proportions above from this 2009 chart still apply now. The Hubbard Glacier in Alaska has been steadily advancing for over 100 years and is accumulating mass near its origin faster than it's losing it in the ocean. (June 2015). The Kutiah Glacier in Pakistan holds the record for the fastest glacial surge. In 1953, it raced more than 7 miles in three months, averaging about 367 feet per day. Tidewater glaciers are valley glaciers that flow down to the ocean and often calve small icebergs. Taku Glacier winds through the coastal mountains of SE Alaska (photo below). Valley glaciers are really mountain glaciers that carve their way through mountain valleys and enlarge them. The "Great Aletsch Glacier" in Valais, Switzerland is a valley glacier and the longest glacier in the Alps at 23 kilometers.. The Aletsch Glacier covers an area of 81.7 square kilometers, has a volume of 15.4 cubic kilometers and declined by 3 kilometers since 1880. Around 400 billions tons of glacier is lost ever year (NASA 2017). That statement is hotly disputed and most climatologists say that the last ice age ended around 10,000 years ago. It is believed the earth has seen much warmer periods between previous ices age than we have now and these lasted for up to 10,000 years. EDIT: Having quoted so many statistics it's possible (in fact likely) that I've made a few errors. I just spotted one which should have said 14 million square kilometers of ice rather than 14,000 - now that would be a pretty significant loss Please draw any errors to my attention - that would be greatly appreciated. Before I produce my analysis of the thickness and volume, I thought that I would like to finish of my review of the current ice extent, mainly by way of adding information. Firstly a quick review of the last 2 or 3 days. After a reduction in all the various monitoring platforms on the 28th, growth has now accelerated again. Gains recorded were over 200K Km2 on the NSIDC platform and around the 150K Km2 on Maisie and JAXA. It should be realised that at this time of the year, the increase is normally around 95 -110K Km. The growth still appears to be continuing in the last 24 hours at high rates. It has now overtaken 2017, but more importantly it is still on an high growth trend. Now another 3 days of this and 2018 could well be in the middle of the 'pack ' having then caught up with years like 2007, 2010 and 2011. As we all know, ice is very fickle, and could well move down just as quickly as it moves up. So the above is not a prediction, but is quite possible. So - How can this happen? I have a theory as to what is happening but I will leave it for now. Other points I would like to clarify is the relationship (in actual graphical terms), between the models. I tend to use Maisie as it is the most reactive, as described in my previous post. Other (and I think very good - if not better), is this chart from ASIF user Aluminium , which shows the rapid ice build up (and decline) in a real time fashion. I am not certain whether the graphics will work on here, but if it doesn't then click and open it in a new window, and it should then work OK. I think it shows clearly where the ice is changing in real time mode (assuming that the graphic works). It shows all ice types and therefore picks up on 'new, slush and Nilas,etc' and this shows up as a difference from the more conventional JAXA and NSIDC products. It seems to mirror Maisie. As an example I show a similar graphic from more conventional sources such as DMI (also applies to JAXA and NSIDC). The following is an ice thickness map (for the initial date in the above graphic in case the graphic does nor work) , but it seems to follow the graphics and extents of say the ADS Vishop presentation service. So I will be using the most reactive tools in order to get the latest trends and feautures of ice growth (or decline). This will clearly show many different trends. The job I set myself is to spot any pertinet changes early, without looking too foolish! Also in reply to my query on Kara in the previous posts. After the drop of 60K Km2 when I was posting my first posts, it increased by 82K Km2 the next day, and this morning it looks to have grown by a much larger amount. The graphics have been updated but not the actual data as yet. On Maisie, Kara has increased by a further (+42K) and (+19K). Whilst total ice has increased by 392K Km2. So the pace of ice refreeze has not yet reduced, and we are now above the average for the 2010 decade. but rapidly catching up with the pack. As the ESS is within 200K of being full and Laptev is about 400K away, it will be up to Kara to keep up the freezing momentum. The fact that we were last 3 weeks ago, and are now heading into the 'upper' reaches shows how volatile ice can be. I am finally getting around to producing my review of thickness and volume and I will be using the just produced data on PIOMAS as published on the ASIF. I have discussed extents in my few previous posts. Basically the message is that there is some small reasons to be slightly less pessimistic. (I am a half full glass type of person). So where to start.? I am intending to concentrate on recent events as I feel that we all acknowledge the events of the last 30 -40 years and BB has described them in full detail. 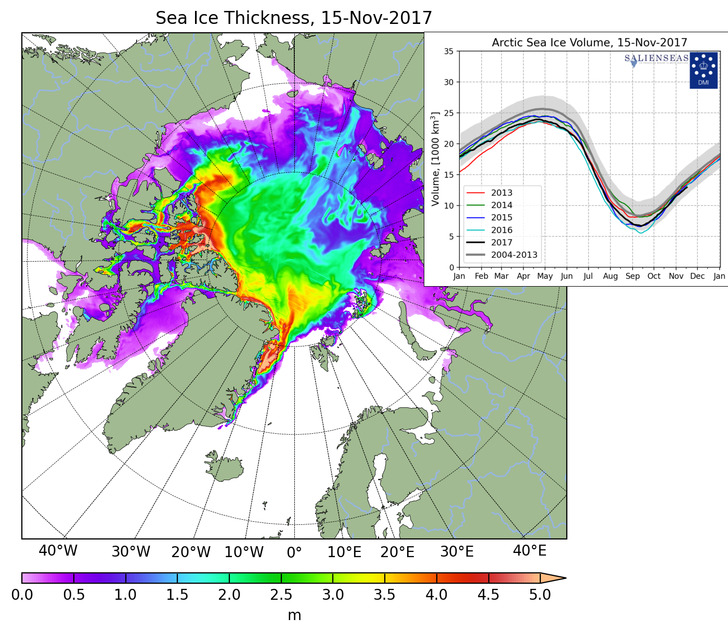 So I will start with the sea ice thickness and volume maps of DMI, since they are produced daily and have a reasonable graphical interface. This is the graph for this year - Compared to the one for 12 months ago. Now as can be seen the ice is more advanced this year in the 'west', but not so in the 'east'. (the Russian waters). Further more the total volumes are not that different due to the gains made over the last few days. We are in practice about 0.3 K Km3 lower, but it will soon be eliminated. (probably). Study of the detail of the central ice pack of the DMI maps shows little difference, but there is a more pronounced portion of 3.5Metre to 4Metre ice this year. I believe that this is significant as it represents the first substantial thickness of ice actually in this area for quite a while (5 years), back to 2013. There was some in 2015, but this was counterbalanced by a huge area of thin ice next to it across the pole.. (see below). 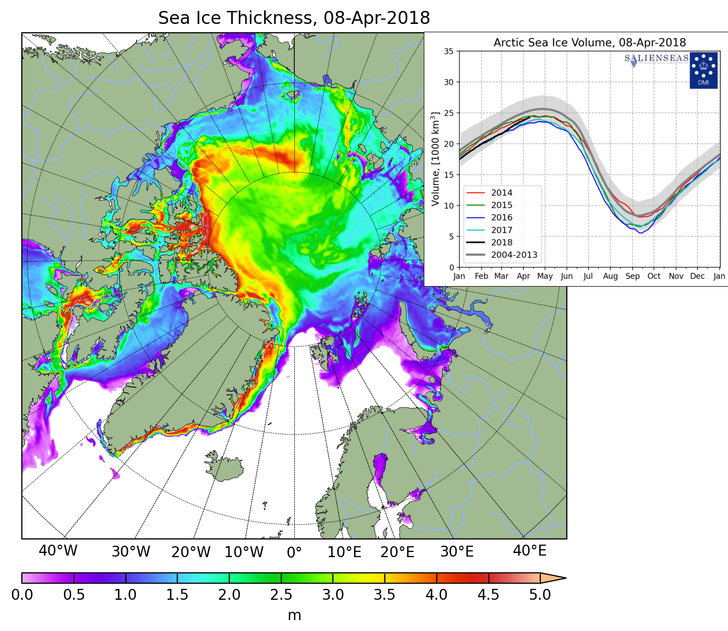 By way of interest this followed a virtual absence of thick ice over the pole in 2014.
and on to the beginning of march (the SSW period) - It clearly shows how this ice 'developed' during last year stretching out from the Russian coastline to 'embrace' it. (These effects can be seen in detail by accessing the chart and scanning through them by day or month). A month late and the effect of the SSW is obvious - Now you can see the effect of the SSW on the ice thickness, in the sudden bulge in ice volume at the start of March and further on by 2 months and we have - Now this resembles the 'lion rampant' - for non UK viewers this is the emblem on much UK coinage and on the England football and cricket shirts - so recognisable, If I carry on through the melt season we come to this - Clearly melting out , but still a patch of presumably thicker ice in its position. It does not seem to have moved very far. Which could be a factor this year. Lastly, and showing the end of the melt season - You can still see the outline of the 'lion' in thicker ice. This seems to have survived the melt season, and is now thickening up rapidly again. So why have I spent some time explaining it all? 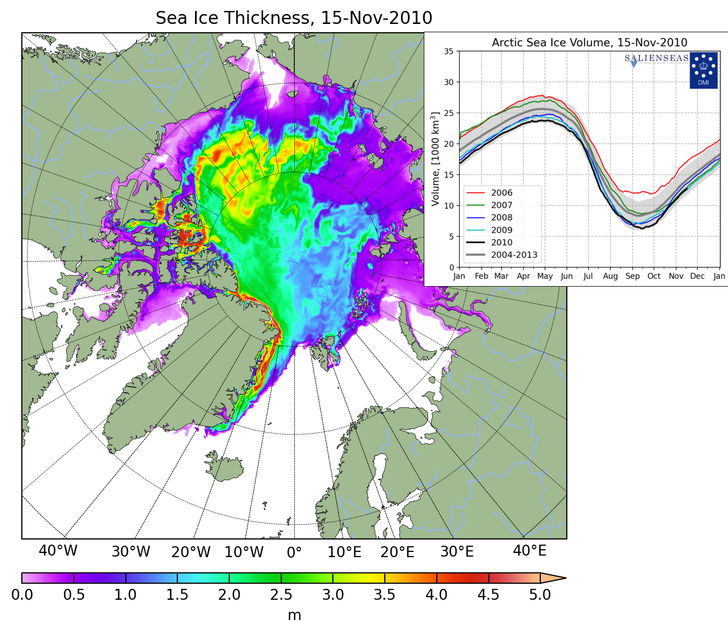 1) That multi year ice is still being produced. 3) That the ice suddenly thickened dramatically during the SSW. To me it is obvious that it is still possible that we could get a recovery in multiyear ice, despite the higher temperatures now in the Arctic. I produce the multi year thickness chart offered up by BB … It shows the dramatic 'drop' of the ice in the early teens. Could it be that in the last 2 years, that the 2 year old ice is starting to recover? I will leave it for now (have been called out!) but I will come back to these points later.. Dave (MIA UK) To Be Continued. Please note: For those wishing to follow the sequence of posts referenced, Dave (MIA) competed his full post (and edited it) after I had responded with this post and that appears "below" this one. Thank you Dave (MIA) - this is a wonderful analysis and this Arctic thread is all the better for your excellent contributions. I can only reply briefly right now as I have an extremely busy business week ahead (already started) and will have little time for weather activities all week (unfortunately). Please note that for some reason my first post shows in the link chart above (perhaps as it's the one at the top of a page) but I added one this week further down. Well you know I have recently posted on Antarctica, Greenland and Global Glacial Ice and this is all land ice which is so much more important than sea ice in terms of sea levels rising (or not) but they are equally important in terms of future warming (or cooling) trends. In that post there, I highlighted the good news in Greenland in 2017 and particularly in 2018 and how the climate change protagonists have put out an incredible amount of misleading data. The deniers also do that when stats don't suit them and the truth is usually somewhere in the middle. My long posts on Antarctica (which has nearly 91% by volume of all the global land ice) showed that things are very different down there with increased snowfall (as in Greenland in 2018) helping to maintain the net amount of ice. That does not mean that there are not problems going forward. I intend to report on the tundra and the melting permafrost regions and on methane gas release quite soon. Again, this is not always "all bad news" but I'll explain all that in my post. This was produced very close to the time of the 2018 overall minimum Arctic sea ice extent. Statistically, what a few readers may not realise or bear in mind (you and I and many who follow this closely will do of course) is that as we lose the really old ice (5 years +) then there is likely to be more much younger ice. During each re-freeze season (and, just for a few seconds, ignoring trends and other factors like circulation patterns, SSTs and adjacent Arctic regional land surface temps - which are all so important) with more open water there is a larger area of ocean that can potentially freeze over. Any remaining 1 year+ multi year ice will thicken during the re-freeze. This is why, while we have seen a worrying decline in older ice (5 year+ and 4 year+), the 3 year + has remained almost unchanged with only small year to year variations but there is not much of it anyway, while the 1 and 2 year old+ ice has increased very slightly. None of the trends are at all even with some quite significant year to year changes. Interestingly, in 2018 we have seen even more 4+ and 5+ year old ice melt as well as 1+ ice but a significant increase in both 2+ and 3+ year old ice (more below on that). This can be explained quite rationally and almost for the same reasons that apply to Greenland and north east Canada land ice. We have seen below or well below 2m surface temp anomalies over the land areas for prolonged periods throughout 2018 in complete contrast to the rest of the Arctic region. We have also seen an extraordinary amount of snowfall in both the winter and summer months in that side of the Arctic. The fresh white snow cover has produced strong albedo effects on many days - something that's so important in the summer to reflect well over 85% of the sun's rays rather than the areas (with melting and darker cover) absorbing more heat. We did have that period of Siberian forest fires and a smoke plume which helped with blotting out some of the sunshine and we did not see the potential downside with ash deposits darkening the ice sheet (I posted on that event on page 1 of this thread). In any event we already have seen in recent years that most of the older ice that remains is largely on the Canadian side of the Arctic with many islands there too assisting with that. Meanwhile, the much more open ocean towards the Siberian/Russian side and especially the waters on the Atlantic side have seen the most net melting in recent years, especially the Kara and Barents Seas. This year, in particular, they have been joined by the Bering Sea which I've highlighted as the most worrying factor in terms of the 2018 re-freeze season. This was largely due to anomalously high NPAC SSTs pushed up by some of those super typhoons and a very active WPAC cyclone season overall. It is no coincidence that the ice that has rapidly formed in the Kara Sea for example, is extremely thin and still largely broken - ie: not yet a full extension of the thick ice sheet but it is getting there (unless this potential pause or setback occurs). That region will be particularly vulnerable to 2m surface temps (quite apart from the longer term struggles with the +ve SST anomalies. Let's hope that northern Siberian temps fall back again soon (I'll take another look at them in my report next weekend). We need a good feed of deep dense cold air from the usual Siberian "freezer" to help with the re-freeze and assist in thickening the ice sheet closer to the coast there. The Bering Sea is a different matter altogether. With vast areas of open water, 2m surface temps often above 0c (with 10c to 20c +ve anomalies for periods) this may take many more weeks to re-freeze and the main ice sheet in the centre of the Bering Sea actually retreated slightly recently - as shown on your excellent animated chart from your recent post (for anyone who missed that - Dave helpfully provided a link and you can view the animations and study the recent changes). What we need is a combination of the following: The land temps to fall. Favourable circulation patterns with the winds blowing from the land areas or at least from the pole side of the Bering Sea off the existing ice sheet to cut off the flow of extremely warm waters from the NPAC - with the WPAC typhoon season drawing to an end, at least further north, we then need to look to a weaker and favourable jet stream pattern. Then the ice can build across from the pole side and out from the coastal areas and fringes. Being much more land-locked on the Pacific side, the Bering Sea "normally" freezes up pretty quickly - so we just need the process to get going and then a rapid catch up is still likely. I know that it was even worse at this stage last year (and in several recent years) but those NPAC SSTs were not so high and the 2m surface temps fell to rather lower levels during November - so we need this to happen in 2018 too (hopefully). My children and Grandchildren were returning from a holiday (in France), and had broken down on their way home on the motorway. I went to get them home. I also had no time to do a spelling check..so again I apologise. Please note: My incomplete post originally appeared above David's (Bring Back 1962-63) post and he replied to that (above) before I deleted it and the full version now appears immediately below. Many of the points I raised were discussed in David's reply post (above) which followed my original entry of my deleted part post. I have discussed extents in my few previous posts. Basically the message is that there is some small reasons to be slightly less pessimistic. (I am a half full glass type of person).. I am intending to concentrate on recent events as I feel that we all acknowledge the events of the last 30 -40 years and BB has described them in full detail. 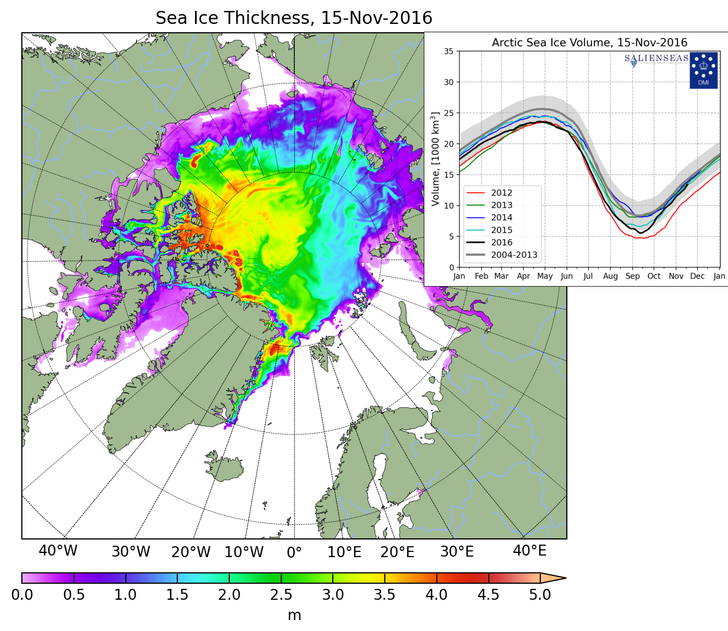 So I will start with the sea ice thickness and volume maps of DMI, since they are produced daily and have a reasonable graphical interface. Now as can be seen the ice is more advanced this year in the 'west', but not so in the 'east'. (the Russian waters). Further more the total volumes are not that different due to the gains made over the last few days. Study of the detail of the central ice pack of the DMI maps shows little difference, but there is a more pronounced portion of 3.5Metre to 4Metre ice this year. I believe that this is significant as it represents the first substantial thickness of ice actually in this area for quite a while (5 years), back to 2013. There was some in 2015, but this was counterbalanced by a huge area of thin ice next to it across the pole.. (see below). By way of interest this followed a virtual absence of thick ice over the pole in 2014. 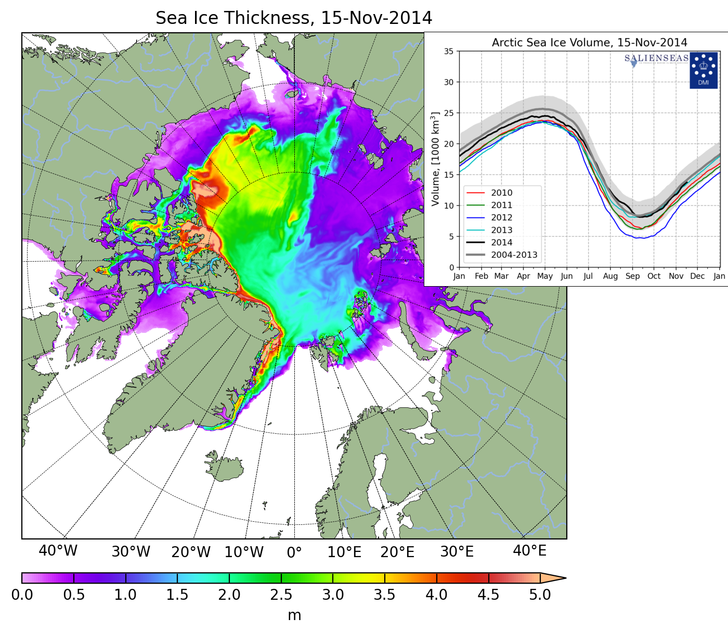 So why do I think this years thick ice is significant? Well I would like to show a series of charts from the last ice year. showing the evolution of this 'patch'. It clearly shows how this ice 'developed' during last year stretching out from the Russian coastline to 'embrace' it. (These effects can be seen in detail by accessing the chart and scanning through them by day or month). 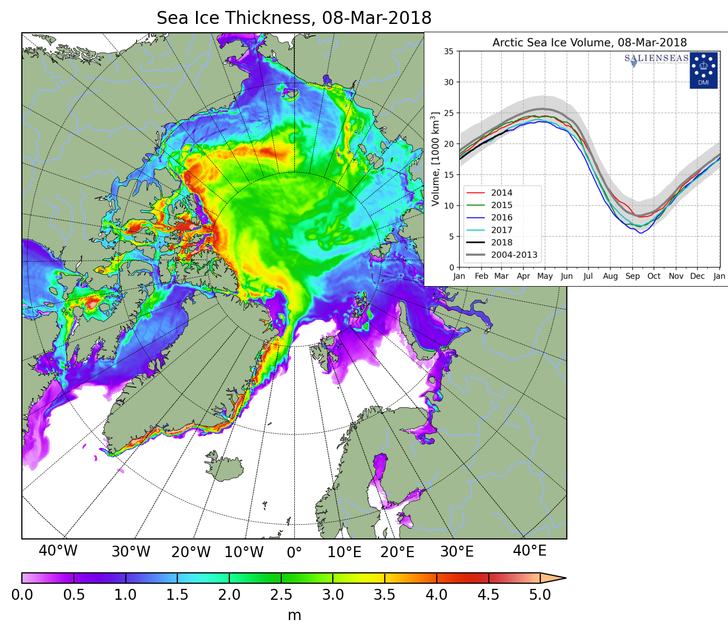 Now you can see the effect of the SSW on the ice thickness, in the sudden bulge in ice volume at the start of March. Clearly melting out , but still a patch of presumably thicker ice in its position. It does not seem to have moved very far. Which could be a factor this year. You can still see the outline of the 'lion' in thicker ice. This seems to have survived the melt season, and is now thickening up rapidly again. So why have I spent some time explaining it all? 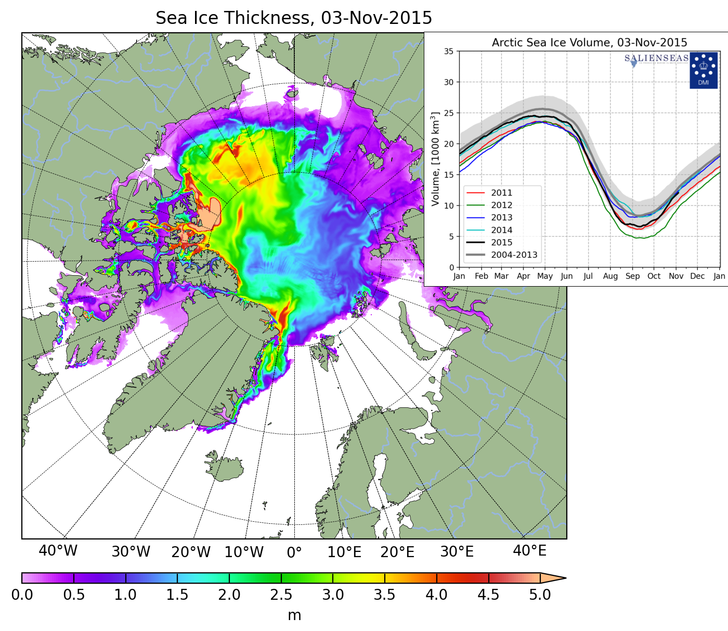 1) That multi year ice is still being produced from the 1st and 2nd year ice. 2) Looking back at previous years it is obvious why we had rapidly reducing multi year ice. (eg 2014 and 2015), as there was no ice capable of surviving the refreeze in the Central Arctic. To me it is obvious that it is still possible that we could get a recovery in multiyear ice, despite the higher temperatures now in the Arctic. It shows the dramatic 'drop' of multi year ice in the noughties and early teens. This total ice thickness, extent and volume loss, was clearly associated with the loss of this multi-year ice. Last year the green and blue portions of the graph increased. (i.e. 2 and 3 year ice). My assumption/belief is that it is the caused by the increase in thickness in the central polar region. This ice has not been as easily melted out in a period of refreeze and the early signs in the 2018 season are that it is increasing rapidly again. 1) This year (2018) has seen relatively benign conditions in the Arctic, with long periods of benign low pressure and relatively weak anti-cyclonic conditions. Only an occasional deeper low crossed the polar cap in July/August, and did not seem to cause too much disturbance to the ice. 2) The cyclone of 2013 obviously caused a massive drop at that stage and resulted in the atrocious ice conditions in the central Arctic in 2014. This may happen again at some stage. 3) The advection of warm air into the Arctic is interesting. a) It was the relatively 'warm air advection' (WAA) into the Arctic stratosphere in February 2017 (the SSW) that led to the massive cold outbreak in Europe and also resulted in the extremely rapid ice volume increases in early March. b) On the other hand an anticyclone centred over Aalska, Bering (or the Yukatan) seems to pull in massive amounts of warm air at low level, and causes rapid ice melt in most of the 'Eastern' Arctic. c) Warm air has been pushed into the Western Arctic for that last 30-35 years through the North Atlantic via the North Atlantic jet-stream and ocean currents. This has clearly resulted in the ice pack around Svalbard being despatched to the North and East, impacting Barents dramatically, and other closer sea areas as well. There are signs that the Atlantic Ocean Oscillation (AMO) is now moving into a negative mode. In the UK we have seen it in the lessening of the SW winds and frequent intrusions of NW winds instead. This would mean less heat arriving in the Western Arctic. d) There is evidence that the volume of ice being despatched from the Arctic by its 'overflow' route of the Fram Strait is diminishing. This (if one follows the ice movement) seems to have been caused by a reduction of cross polar flow. The ice is not moving anti-clockwise around the basin (across North Greenland) and down into the Fram area, as was the case several years ago. Indeed there have been times when the ice movement is clockwise - follow the 'lion rampant' for its movement last year, and you will see it turn to the north for some periods. It is possible to see that it actually reversed during the SST in February/March timeframe, and has remined very low for the last 2 years. e) the impact of Global Warming in the area, and its associated impact on the ice. Much has already been written on this. The only thing I would point out is that despite average anomaly temperature figures of +(3.0 - 5.0C) for weeks on end this refreeze season that the ice still has achieved a rapid recovery, presumably because of the benign conditions up there, and once more presumably a certain temperature was reached..
or maybe it is possible that we are seeing some unexplained feed-back effects. particularly over the last 2 years. The Arctic is clearly a very complex environment. There is much that we still need to understand. 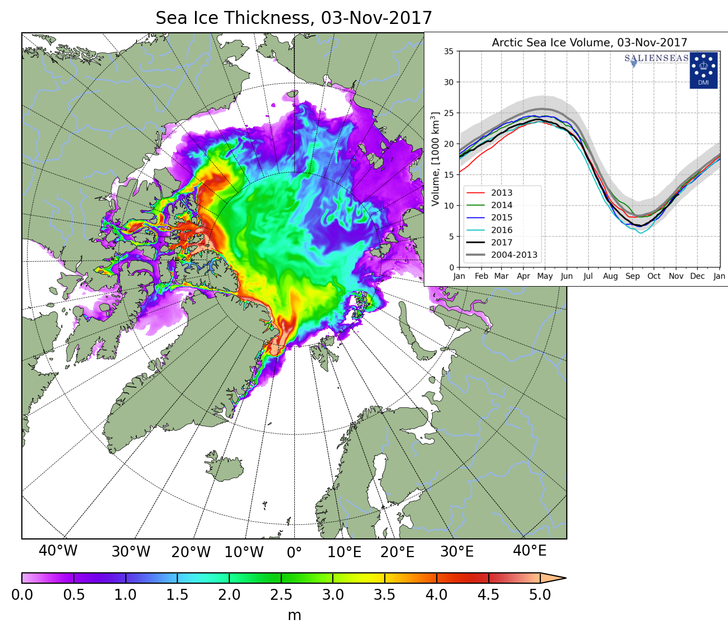 @Bring Back 1962-63 (David)'s posts on sea ice thickness, age and the various weather patterns bringing about the multiple patterns we've seen in recent years are in my opinion (and I'm sure many others') an excellent round-up of the situation, the likes of which I've not seen even on the dedicated ASI forum. Some quality contribution from MIA UK (another David ) as well, on similar areas of the subject. It's a relief (but not surprising) that at least some multi-year ice is still able to be produced; now we just need some to stay within regions that see ice-supportive conditions for more than 2-3 years - something sorely missing in the past decade. Odds are we should gain some 4-year ice to go into next melting season with so that's something. Also - I've been wondering about FRAM export and whether it's really reduced or just appears that way due to the ice melting out further north. Not sure how one goes about assessing that to be honest! It's going to be a really big deal what happens over the coming 5 months in the Pacific and Atlantic-side waters that have higher salinity then ever previously observed. Should the ice struggle to achieve consistent coverage there until record-late (or at all) then the case for a slow-but-sure 'salinification' of the Arctic will gain strong support. This being something to track closely in the freezing season while we wait to see whether any melting seasons are able to 'out-force' the negative feedback of increased ocean-atmosphere moisture transport and bring about a strongly melt-supportive May, June or July (the latter two being the most significant)... and whether the observed fragility of the ice will (in such a scenario) actually mean that we see unprecedented extent and/or area loss rates as a result. Speaking of fragility, I'm reminded of some posts on the ASI forum some months ago that discussed the possibility that the more mobile state of the ice as a result of it being more fragmented and allowing greater wave penetration is resulting in newly-formed ice being less 'pure' with higher saline content than was typical in decades past, making it more vulnerable to mechanical breakdown in particular. Another fascinating aspect to explore perhaps? Well first of all hat's off to Dave @Midllands Ice Age (UK). Rather than a pause, the re-freeze has actually continued at an impressive rate. Nevertheless, there are still various concerns. I'll comment below each chart. Please refer to the Arctic map in my introductory post to this thread which shows all the Arctic regions and seas. The overall Arctic sea ice extent has recovered strongly but is still below average in many parts, especially in the Bering Sea (almost no ice), the Chukchi Sea, the Barents Sea and part of the Kara Sea. The exceptions are in the Canadian Arctic (fully frozen) and Baffin Bay (west of Greenland) as well as in Hudson Bay and the Gulf of St Lawrence which are starting to freeze over rather earlier than in many recent years (although 2017 was an early re-freeze for Hudson Bay too). Much of the main ice sheet is approaching 90% to 100% ice concentration. This chart is from that part of the NSIDC site. This map shows how quickly ice extent recovered during October and this continued into November. It's normal for there to be pauses or setbacks in the rate of recovery during the main re-freeze season. So far, 2018 has seen the fastest continuous recovery since early October compared to any of the previous 7 years. Only 2012, which saw the record minimum extent, comes close to matching 2018. Unfortunately, all these recent years are below or well below the 1979 to 2006 mean. The good news is that much of the Arctic has cooled down significantly in the last 2 weeks. The Canadian Arctic and Greenland have been persistently colder than most of the rest of the Arctic region. Many parts of Siberia and northern Russia have cooled off more than forecast (just 2 weeks ago) which is probably one of the main reasons why the re-freeze has continued apace. The 2m surface temp anomalies for this month to date are actually not as bad as those at the time I last posted this chart (in my post on October 20th on page 2 of this thread). Back then the Arctic Ocean was running at +4.012c; the whole of the Arctic region (66N-90N) was at +3.532c; the sub Arctic and Arctic (60N-90N) was at +2.709c and only Greenland was colder at -1.19c. This chart shows the predicted anomalies for T+!68 or a week from now. 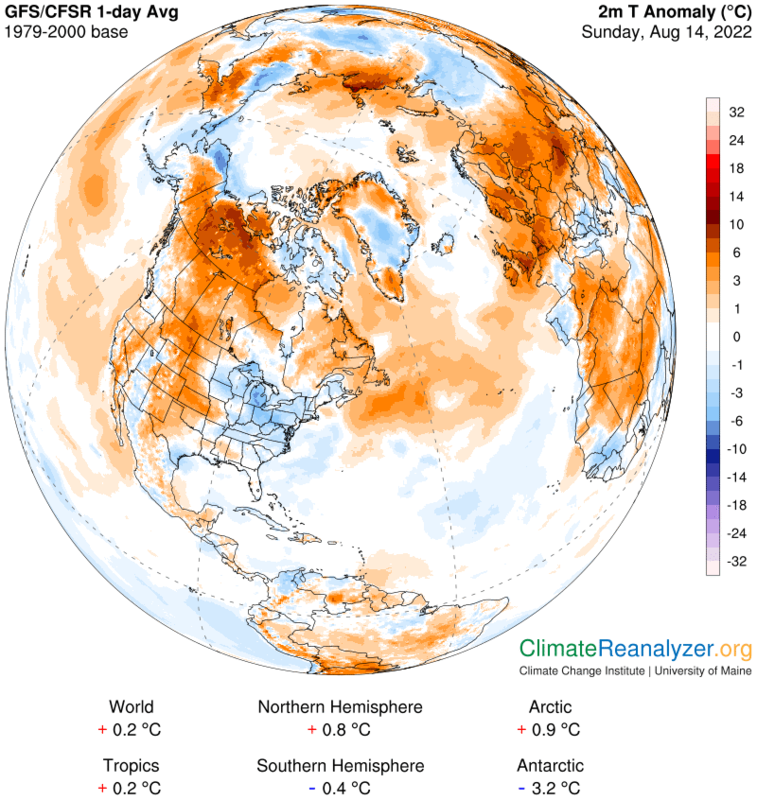 The cooling trend is expected to continue over almost all the Arctic and sub Arctic region and over the ocean with temps returning to closer to normal with only Greenland becoming much warmer. Given that temps there will be in the -20c to -40c range, a + 4.45c anomaly is not too much of a concern. This was average regional anomalies but we can see the actual distribution. North east Canada is going to become even colder and a slightly colder than average area extends across (and to the south of) the pole and into Russia. Even the very high anomalies in the Bering Sea and Chukchi Sea are expected to ease down to some extent. This chart (from the Zach Labe site) puts the current warmth into context. There was a period in mid summer when 2018 was running just below the 1958-2002 mean but it has been running at close to record warmth since then. The thin lines cover the range from 1958 to 2016. The predicted further cool off should help to to take 2018 back into the range seen in most of the recent years but still slightly above the long term average. ...SSTs. The areas of open water below 0c have expanded steadily (as they should do approaching winter). Sea water usually starts to freeze at SSTs below -1.5c depending upon salinity and circulation patterns/wind strength. The anomalies are actually improving too! There are still those exceptionally high small areas with anomalies of +6c to +8c and those in the Bering Sea are still very high (but falling). The overall area of +2c has declined and much of the far North Atlantic is actually below average. Is this a sign that "if" we see a continuing weaker jet stream and disorganised tropospheric PV plus favourable circulation patterns that SSTs might fall back to less high anomalies? In a future post, I'll compare these anomalies to those since 2014 (just prior to the super El Nino that pumped in those warm waters) and examine the trend much more closely. Thanks again for another fantastic post. The information you display and produce is the best I have seen. 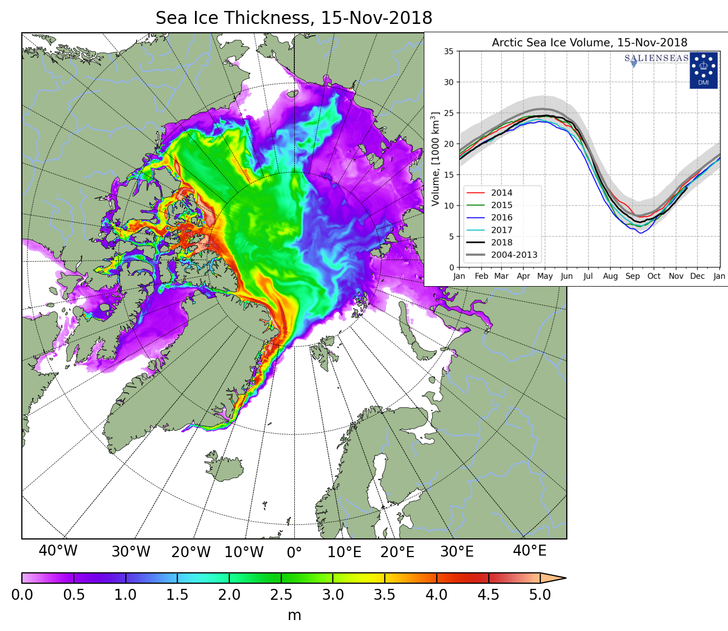 This really is an update from me, but one in which I would like to look at what has happened over the 8 -10 years in more detail, in order to see to see what has caused the major impact to multiyear ice. First of all the current extent (and area) continues to improve (relative to recent years) apace. Kara is still filling in quickly, keeping the NH daily gains quite high, and now (despite my, and others concerns) the Arctic perimeter areas such as Bering, Chukchi and very recently Barents appear to be gaining momentum, and keeping the comparative rates for 2018 refreeze looking very good. From being last 6 weeks ago the extent seems to be somewhere between 8th and 10th depending upon the measure and ice service chosen. Hudson and Baffin as previously discussed are now in full ice growth mode, and Hudson could fill up very quickly now. Can the ice continue on this more rapid growth path? At the moment the refreeze is at similar rate to these reported in the 20th century. though clearly not in such a solid position. I will not dwell too much on the above as other forums deal with this on a day to day situation. 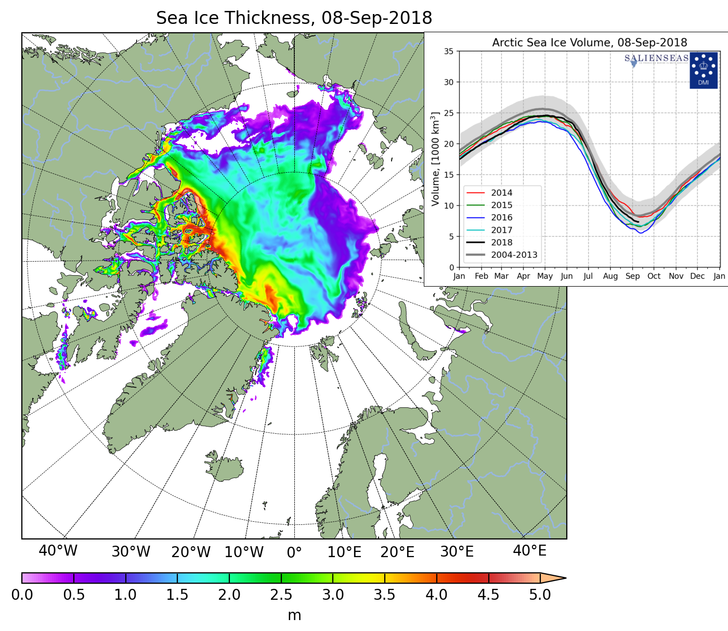 What I wanted to do in this post was to use the same techniques I used for displaying the changes to ice thickness in the last year in my previous post, which clearly showed the ice development to be 'stronger' in the Arctic above 80 degrees this year, and therefore for its possible effects for the future of the pack. By examining the last 10years it is possible to see why we have ended up with the poor state of multi year ice we have today. First of all I have chosen a pretty random recent date - 15th November 2018 - as the current position. As can be seen the area of increased ice thickness I discussed in my previous post is still enlargening and becoming also thicker. Also note the increased yellow in the Arctic circle. The Arctic now looks reasonably healthy in the central region, (the vital area for multi year ice to survive), although not so good in Barents (where ice never survives in the summer), and Bering is now about average for the last 10 years (as you will see), and Hudson and Baffin are above average. Going back to 2017, and further back you will see how the ice has fluctuated over the last 3 years (back to 2015), but has never been 'thick' in the Central/East areas. Bering, Hudson, Baffin worse than this year, but slightly stronger in Barents, and around Svalbard. 2016 - much worse than 2018 in all areas! 2015 - similar extents to this year with a 'nice' patch in the Central patch of thick ice, but also with a massive areas of very shallow ice right over the pole, which appears to be the ' left over and not recovered ice' from the poor state of the ice in the central area in 2014. Siberian side, which would allow rapid melt the following year (2015 summer), but the extents, particularly around Barents are looking good, although Bering is 'suspect' and wide open. and Baffin are also down. 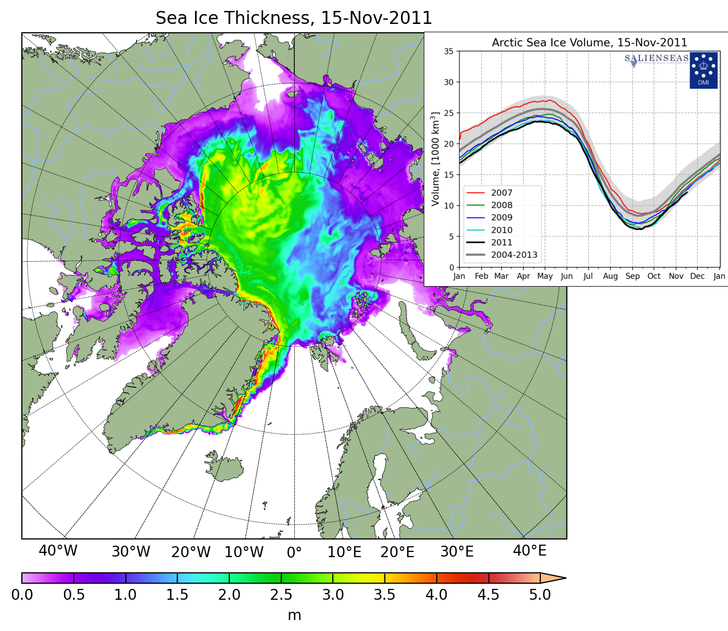 2011 - Extents lower than todays, but the central ice looks very 'stable'. 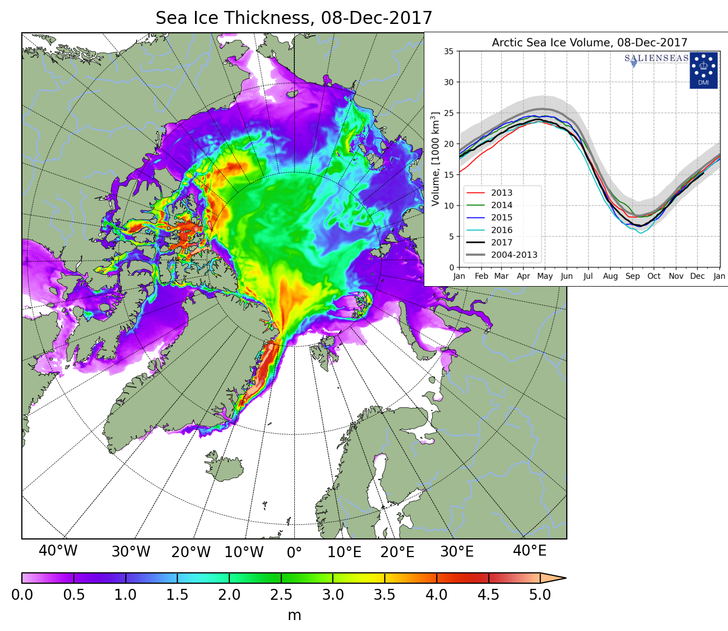 2010 - Extents a bit lower than 2018, but central ice looks thicker/stronger than today. 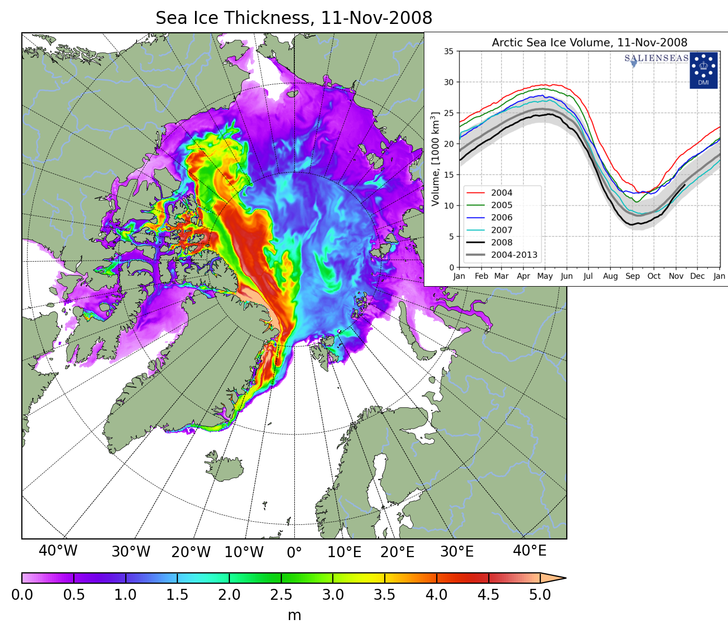 2008 - A very poor Central ice pack following on from the 2007 rapid drop, but the extents seem to be similar to today. 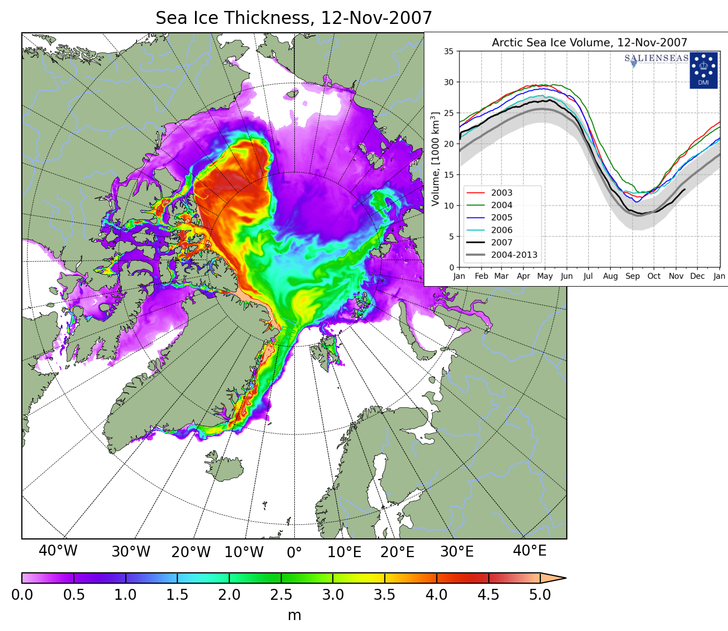 2007 -Extent lower in all areas, and a massive 'hole' has eaten into the ice from the Bering side. 2006 - Similar extents as compared with today apart from Hudson and Baffin, which were much lower in extent. So. it looks as if 2 major events hit the central ice pack and both occurred from the side of the Bering Sea. One in 2006-2007 and the other in 2013-2014. Now we know that the great Arctic cyclone hit the ice in 2013 -2014 year, and this appears to have caused the chaos in the 2015 -16 winter seasons, but a recovery seems to be taking place at the moment. Did we have a similar event in 2006 - 2007? In each instance, however, the ice seemed to be recovering. It does not appear that temperature is the defining factor for the ice regrowth. It is clearly very important, but the ice over the last few years has shown 'regrowth' (when it is allowed to), despite high Arctic temperatures. These two occurrences explain the precipitous drop in the multi year ice in the period of 2005-7, and again more recently, as seen in multi year ice graph above. I think that it is asking too much for the ice to recover all its multiyear ice, as it possibly will require a spell of 10 -15 years without a major 'disaster' year. To do this we will need either a cessation of AGSW(? ), or a major change in the atmospheric patterns which have been driving 'ice melt' events into the Arctic, maybe even both. However the Arctic does show signs of attempting to recover on each occasion, so perhaps all is not quite lost just yet! First off @Midllands Ice Age (UK) and @Bring Back 1962-63 Thank you for such a brilliant objective presentation on the subject. I will cont to look forward to the updates as they become available. Somewhere above one of you two briefly mentioned the direction from which the more fragmented ice is moving; however, one thing I did not see specifically mentioned throughout the 3 pages of incredible information is the "Beaufort Gyre". I have recently been reading about this and that there appears to be a delay in the periodic large scale reversal of the gyre on the order of several years. I've been following along with the Beaufort Gyre Exploration Project headed by the Woods Hole Oceanographic Institution which concluded in Sept.(http://www.whoi.edu/website/beaufortgyre/home) Im wondering what role the Beaufort Gyre's current state and potential large scale reversal has on the big picture. Also on a separate topic, but not sure where to post it, Its been claimed that approx. 80% of the worlds volcanoes are located deep beneath the surface of the world oceans; many if not most of which are, simply stated, unexplored and poorly researched. I'm wondering if there is somewhere within 33&rains threads, and/or somewhere else, links to information/research into the roles(if any) of total magma output/volcanic activity occurring beneath the oceans surface and how or if they perhaps contribute to the overall large scale ocean currents (deep sea or surface) and perhaps consequently the SSTA patterns over time? ie: oscillations such as the AMO on the Atlantic side; PDO and perhaps even some influences on overall ENSO cycle frequencies and/or intensities in the Pac, and perhaps the IO dipole SSTA configurations to name a few? It appears that at least from some of my research into the topic, that the sun and sun spot cycles etc may play an important role on earthquake activity, and consequently changes in the movement of the earths liquid core. Perhaps in a similar fashion to how the jet stream patterns at various levels of the atmosphere are driven by temp gradients horizontally between the northern latitudes and southern latitudes as well as vertically between the depths of the troposphere and stratosphere, the oceanic currents are driven in a not that dissimilar fashion in both a horizontal and vertical fashion with fluctuations in deep sea volcanic activity on the order or months, years, decades, and perhaps longer influenced by solar cycles and other more cosmic effects are a much more important drive in Oceanic SSTA effects than we currently know? I feel like there is a huge void in the research into the potential fluctuations in underwater volcanic activity combined with the more mundane but constant deep mid Atlantic ridge magma activity the role of which may get overlooked (combined with many other important atmospheric driving factors of course) in the big picture in driving ocean currents and perhaps larger time scale SSTA configurations/fluctuations. Again any links to information or just general discussion about the subject is greatly appreciated. Keep up the phenomenal work. Hi @Sroc, thank you for your kind words and fascinating contribution. You raise some very interesting questions. I have only read a little on the "Beaufort Gyre" but I do try to keep abreast of these types of research projects (I've been focusing more on Antarctica and Greenland recently). I started this thread so that we can examine all aspects of the Arctic, Antarctica, Greenland and global land, glacial and sea ice. So far, I've been trying to pull together as much of the facts as possible and we are just about ready to move onto more specialist matters. I've been studying the Arctic for over 40 years and I'm a very strong believer in taking an open minded and balanced view on climate change and would hope that we can get at the real facts and hold respectful debates on here. This is a truly vast subject - fascinating, exciting and worrying all at the same time. Would you like to produce a fuller post on the Beaufort Gyre? You could kick off with the facts and data, then go through the work of the "Exploration Project" and then make various comments/ask further questions. I and several others will respond. You then move onto other teleconnections. Some of these are directly related to the Arctic/Antarctica, some more indirectly related and some not so much. I also post regularly on the Teleconnections thread. Volcanism belongs on both threads. Just like solar activity, this has only been touched upon on the Tele thread so far. I plan to do posts on both these topics and on magnetism (partly linked to both of them) on the Tele thread within a month or two. Much sooner, I plan to do a post on here on Antarctica's volcanoes and volcanism, earthquakes and their impacts on ice stability. There is quite a bit on the Tele thread already on ENSO, SSTs, the AMO and the IOD - not much yet on the PDO. Some of us (including myself) are truly fascinated in the oscillations, especially the longer term ones. The recent research into deep ocean currents (with the rapidly expanding network of mixed depth buoys) and the ocean floor deposit samples are now advancing our understanding at a great pace. It is now believed that the changes to the AMO start off deep in the southern oceans around (well off) Antarctica and these then upwell off Africa and may also impact on the AMOC (Gulf Stream). It would certainly make sense if these deep currents impacted on the Pacific in a similar way - not just the PDO but the PCO (the centennial oscillation). It is quite possible that these longer term oscillations work to quite specific time frames/cycles and may have some strong influences on "natural variability" and this is vitally important in terms of overall climate change and global warming matters. You mention the whole atmosphere and a really specialised subject is understanding Atmospheric Angular Momentum (AAM). Rossby waves can propagate laterally, polewards from the tropics (and in conjunction with the the torques influence the path and strength of the jet stream), vertically right up into the stratosphere and even the mesosphere (and help to trigger major warming events and SSWs) and more recently discovered (although mentioned by Carl Rossby himself in his 1939 paper) downwards into the oceans and certainly influence near surface currents and possibly even deeper currents. This combination of factors is partly examined on both the Tele and Stratosphere threads but not yet the ocean current influences. I have hundreds more to add and many of these are Arctic related. Needless to say, time is a very precious commodity. 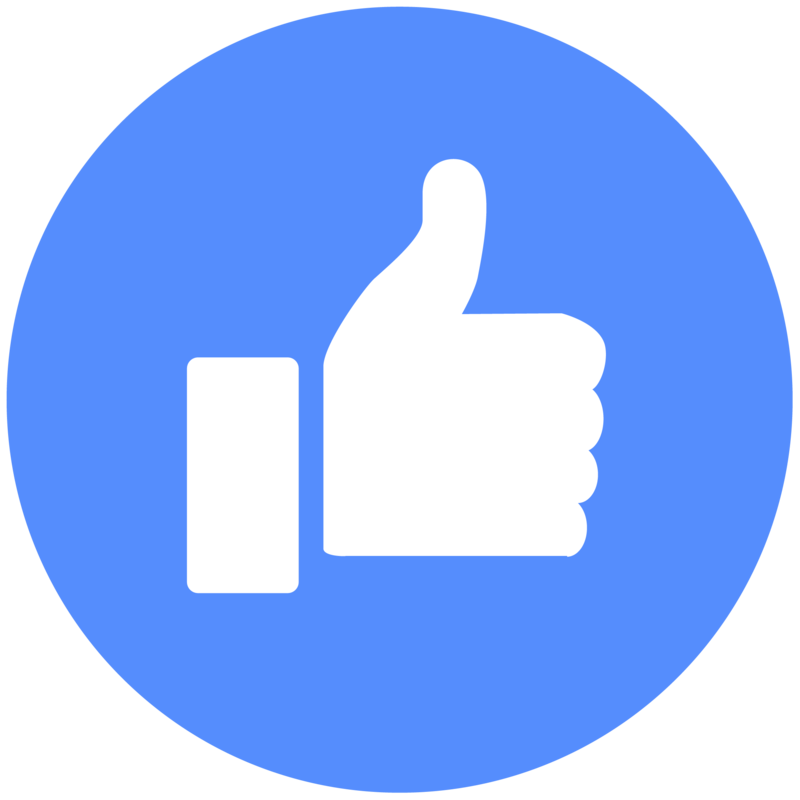 I run a full time online business (not weather related) and spend much of my spare time on this forum. The portal work is never ending. I'm currently preparing an index for the Tele thread to list all the main posts under topic headings with direct links. I will do the same on this thread after that. I have so many posts that I wish to do and also get involved in various debates. I'm from the UK and also active on a forum over here. c) the things we are still are yet to understand fully. And also like medicine as we continue the pursuit of the things we almost fully understand and the things we are yet understand, we realize the things we thought we knew for sure were in fact wrong and fall back into the category of we think we understand or are yet to understand. The "butterfly effect", if you will, or the understanding of the interactions between depths of the oceans, atmosphere, cosmos, and now humans is what really intrigues me. There is a ton of crossover in the general way of thinking and approach to the subject from my professional life and career and my deep passion and hobby that is weather and climate. Medicine and physiology is very similar in that what happens in one area can have both direct and indirect or major or minor effects on other areas. A dysfunction of the endocrine system, for example, can not only directly affect other areas of the endocrine system, but also indirectly have either positive or negative effects(depending on ones perspective) on other aspects of the body simply stated. The analogy I use in an attempt to get a laymen to understand the challenges in medicine is to describe it like an intricate dance. Lets use the endocrine system as our example once again. Take a single hormone in the body and the bodies ability to regulate its levels and pretend its a couple on a dance floor doing a waltz. If the couple does not move in perfect harmony with one another then there is the potential for them to step on each others feet and stumble around the dance floor instead of a smooth coordinated dance. Now lets throw all the other hormones the body produces on the same dance floor. Not only do we have to coordinate the movements of a given individual couple; now the challenge is to coordinate the smooth rhythm and timing of many couples on the same dance floor. If one couple begins to stumble we now run the risk of that couple bumping into another couple, who might bump into another couple, and so on. Now if we are looking at the dance floor from an objective vantage point what we see are multiple dance partners stumbling around a dance floor. The questions asked are where did it start? Did more than one couple stumble at the same time on separate sides of the floor or did one couple start a chain reaction? Where do we begin to fix it. Which couple(s) do we get back on track first that will maximize our chances to get everyone back in sync again? IMHO this basic analogy can apply to weather. When looking at the complex interplay and both direct and indirect effects between Oceans, atmosphere, sun, human emissions, and the cosmos like is being done on this forum, its easy to see just how ridiculous it is to think that us silly little humans have it all figured out. Anyway My apologies for the tangent as this in no way applies to the past, present or future state of the arctic. Here is where I finally real it back into the topic at hand... I am a mere weather enthusiast, so some of the technical data regarding the Beaufort Gyre project specifically goes beyond my scope of understanding. That said I will do my best to contribute when or where I can. I just love getting the wheels of my mind turning thinking about all of it. Thanks again for a brilliant set of minds on this site. I was about to come back this week with more detail on two of the points that you raise. (yes it was me who suggested that maybe something has changed in the general arctic with regard to the movement of the ice in the Arctic). First of all can I say what a fantastic mine of information is contained within the link you provided. It details not only the Beaufort Gyre details but the research being carried out in the Arctic over the last 30 - 40 years. It also provides a history of man's attempts to 'conquer'. and understand the Polar environment, and it contains many scientific references. It certainly would benefit the portal if it is not there already. It may be necessary to 'zoom in' a bit on the area just to the North of Central Greenland. There you can find a small bit of 'green' ice. It is a small patch of thinner ice. Why is it of interest? Well it has been around this area for the last several months. It has shown no sign of moving into Fram whilst the ice to the west of it tends to move towards Beaufort (and the gyre) . I have already noticed and reported that Fram had virtually closed down since the SST in February. Rather than showing all the reports can I ask that you access the DMI site and move back through the data using the 30 (or 1 day) buttons. It is clear that the only ice moving into Fram this year has been that which originated around Svalbard, and as we all know that is not in plentiful supply at the moment. Other years, with large export via Fram, show the ice movement anticlockwise from Beaufort along the North Greenland coast, (with only a small amount joining from Svalbard) and then out through Fram. This process is described in the link that SROC supplied as being measured by the AOO (Arctic Ocean Oscillation) index. Can I recommend that people read the section entitled Arctic Ocean Oscillation Index in the Results section. The two movements are described as being caused by the Anticyclonic Circulation Regime (ACCR) and the Cyclonic Circulation Regime (CCR). It seems as though we have been in a ACCR dominated flow for a few years (1997?). I will copy in the Introduction section see the end of my post, but it is all worth reading. Could it be that there is little more ice that can now be exported via FRAM under this clearly ACCR event? Whereas during CCR (with an anticlockwise momentum) events we can expect the movement of the ice in the Beaufort Gyre to be passed across and into Fram. So quite a rapid temperature drop in the Chukchi and Bering area of about 2 - 3C. So we appear, potentially, to be in a 'good' situation at the moment as regards ice export, but will it last? Figure 1 Illustration of the AOO index definition and physical meaning. Annual simulated sea surface heights (cm, contour interval is 10 cm) and ice drift (blue arrows) under CCR (left) and ACCR (right) wind forcing. Red dotted isolines depict SLP (hPa, contour interval is 2 hPa). The red arrows in the yellow box show how gradients of sea surface heights (AOO indices) are calculated: differences between sea surface heights in the center (A) and periphery of the closed circulation (B) are divided by the distance between chosen sea surface height isolines. Note that AOO index is non-dimensional. Anticyclonic circulation has positive sea surface height gradients (AOO indices) while cyclonic circulation has negative gradients (AOO indices). Figure 2 Simulated annual sea surface heights (black contour lines, cm) and wind-forced ice drift component (blue arrows) after 1993. The sea surface height contour interval is 5 cm. The value of the AOO index is shown in the top right corner of all panels. Annual sea surface heights and wind-forced ice drift patterns for 1946–1993 are shown in Proshutinsky and Johnson . Figure 3 AOO index and circulation regimes. 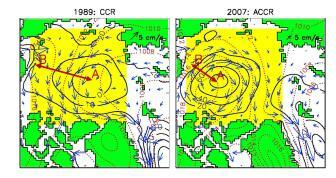 Panels (a) and (b) show typical annual distributions of SLP and surface winds for cyclonic and anticyclonic atmospheric circulation regimes, respectively; red arrows show prevailing cyclone tracks, summarized from panel (c). (c) Greenland Sea cyclone trajectories for 1949–2002 (this is fig. 2 from Sortenberg and Walsh ).White dots indicate the start of each cyclone trajectory and the white and grey lines show two different paths identified by cluster analysis and well supporting SLP distributions corresponding to circulation regimes shown in (a) and (b), respectively. 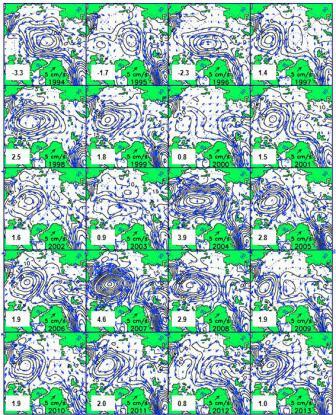 This means that annual SLP distribution patterns express statistics of cyclone counts—prevailing cyclone trajectories. (d) 1946–2013 mean wind-forced simulated sea surface height (SSH) distribution. (e) First EOF mode (48% of the variance) of the annual sea surface height pattern. (f ) AOO indices. The thick black line depicts the 5-year-running-mean time series of the AOO index derived manually following the approach of Proshutinsky & Johnson  and definition provided above. Positive (blue bars) AOO indices correspond to years with ACCRs and negative (red) bars show cyclonic regimes. Coefficients of the annual first EOF mode of the simulated wind-driven sea surface heights as the 5-year running mean are shown as the blue solid line. GSA years are shown as shaded boxes. (g) Spectra of the AOO calculated from the timeseries of the detrended annual AOO index from 1946 to 2013 using the Tukey window with band width 0.279 rad yr−1. The vertical blue bar denotes the 95% confidence interval of the peak with corresponding frequency ω =0.551 rad yr−1 (11.4 years). There has long been motivation to find the basic mechanisms that cause the observed changes in the Arctic atmosphere-ice-ocean system (e.g. Bradley & Miller,1972; Budyko,1977; van Loon & Rogers, 1978; Jones et al., 1986; Wadhams, 1994; Dickson, 1999; Vinnikov et al., 1999; Hakkinen and Geiger, 2000) at decadal and shorter time scales. Climate indices, such as the North Atlantic Oscillation (NAO; e.g.Walker, 1924; Hurrell et al., 2003), the Arctic Ocean Oscillation (AOO; e.g. 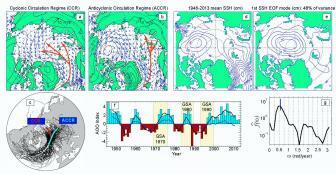 Proshutinsky & Johnson, 1997; Proshutinsky et al., 1999, 2002; Dukhovskoy et al., 2004) and the Arctic Oscillation (AO; Thompson and Wallace, 1998) have been constructed to characterize complex climate processes and explain past variability. However, attempts to predict the NAO and AO cycles were not successful (e.g. Wunsch, 1999; Stephenson et al., 2000; Dickson et al. 2000). Compared to the NAO and AO, the AOO index, defined on the basis of a wind-driven simulated sea-surface height field across the Arctic (Proshutinsly and Johnson, 1997) is a more Arctic-centric index. The index is a measure of the intensity and sense (clockwise/anticyclonic or counterclockwise/cyclonic) of the Arctic Ocean wind-driven circulation. Below, we explain the mechanisms regulating changes in the Arctic circulation regimes and environmental parameters at decadal time scales using this index. Over the period 1948-1996 the AOO has been shown to be the most appropriate index to capture variability in key Arctic environmental parameters (Proshutinsky et al., 1999; Polyakov et al., 1999; Overland, 2009). With regard to the above topic of subterranean activity it has recently been identified that at least 2 volcanos appear to be active in the Barents Sea region. The following Google earth graph indicates 2 areas with very abnormally high temperatures and also large amounts of CO2 and CH4 being discharged. Could the following have anything to do with polar ocean warming via both the ocean temperatures and AGW effect.? It looks as if warm water is 'boiling/bubbling' to the surface in 2 locations around Svalbard. This will prevent ice forming in these areas. Examine the following Earth map showing ocean waves/currents and temperatures in the region. Look at locations 77.95N and 5.48E for a 'mad' surface temperature of 19.4C, or even 75.89N and 31.04E where it reaches 10.1C. In addition over on the ASIF thread they have been following a patch of revolving ice on the edge of the ice as it approaches the NE coast of Svalbard for a couple of years. What we do not know is whether these features are relatively recent, or whether they have been active for some while and can hence be discounted. Anyone know if the Google Earth has an 'archive' facility along with the Subterranean options? Without doubt there are many underwater areas with magma and movement of the earth's crust beneath. We know that there is a ridge running up through the Barents and up into the Arctic, it being the extension of the Icelandic mid Atlantic ridge.. It could well be that the 'weak solar' does have an effect, but there are people who know much more than I, and the above Google Map shows how 'neatly' the large volcano sits between the Atlantic jet current passing around Norway and the return current passing down the east coast of Greenland. It clearly is an area where more research needs to be carried out. I will perform and report a weekly review into the weekly current ice situation.... tomorrow. A quick update of the ice changes over the last week. 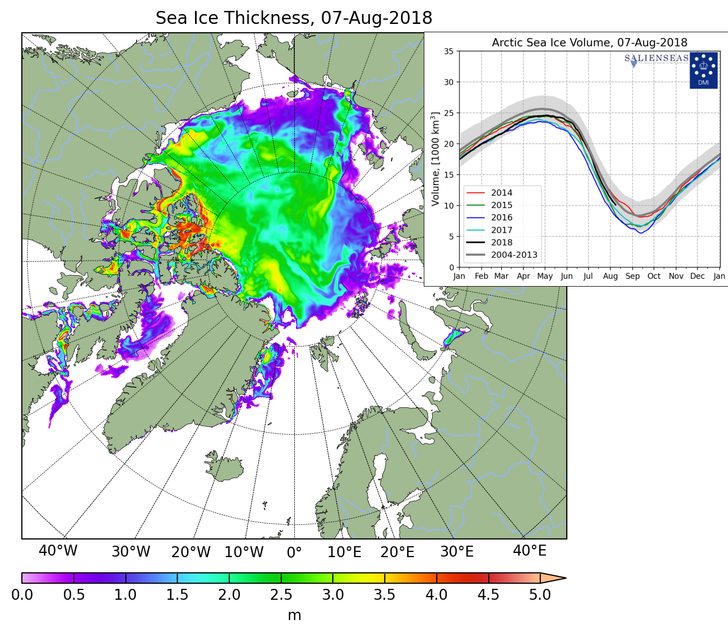 The Arctic sea ice has expanded throughout the last week, and is now (according to JAXA) in the 13th of the 14th during the period since 2004 in the satellite era. The rapid ice growth has continued, mainly in the Hudson Bay and closely associated regions, whereas the regrowth elsewhere has been unremarkable, after the sudden bursts of growth in the ESS and Laptev 2 weeks ago, with Kara then following on behind. The regrowth in Kara is now almost complete, and the attention will turn to the peripheral regions of Barents, Bering, Greenland, Baffin and the East Siberian Sea (ESS) for the next phase of growth. The question that must be asked as whether or not we can continue with the ongoing melt rate over the next 4 weeks. I must admit that I expect the rate to fall somewhat so that we end up somewhere in the 6th - 8th positions unless conditions change. This will then hide the most remarkable recovery we have seen in Arctic Ice. Could it be that the fact that the ice refused to refreeze for so long at the start of the season, enabled more heat to escape and hence result in a quicker refreeze?. Net weekly gain about 100K KM2, around 300K Km2 below the 2010 average for this period. The last week has seen a reduction in the extreme cold over North America. This has affected the rapid ice gains being registered in this area. Hudson has actually lost (-4K KM2) and Baffin(+20K Km2) has only recovered in the last couple of days. The Atlantic front ice has also been pushed backwards and forwards and ended up with little change. Small gains were recorded in Kara, Beaufort and the ESS as they filled. Chukchi registered gains of around (+100K Km2) as the thicker ice from the Beaufort gyre extended eastwards into the region, although this pushed the ice already forming in Siberian side out of the way again. The first signs of ice formation in the SOO, Bering and Barents was observed during the week, around average in most cases for the date, and Baltic and Labrador Str, started to form, Ice also has just shown around the NW tip of Iceland. Temperatures were higher earlier on in the week, with DMI first of all rising, but falling again in the last 2 days. So it looks as if (as expected) the ice has fallen from the extreme levels of last week, but it is now in a reasonable position, and I expect some consolidation next week towards a respectable 6th to 8th position. So 2018 currently in 9th (down from 13th last week), but is still above the 6-8th range expected. This next week looks to be the defining week for the 2018 season. Another 'low' week will see any notions of an ice recovery, a good week will still leave the option open. I had been hoping to spend more time on this thread but I have had various business commitments which have reduced my overall weather time and only some of this can be here on the Arctic thread. I was hoping that a few more members would get involved on this thread. During the Spring, I intend to start a debate on here wrt to Arctic Amplification and the extent of its influence on both the tropospheric and stratospheric patterns. I have a number of key papers to review on this fascinating and highly important subject. In the meantime, this post will provide a long overdue update on current Arctic ice extent, surface temperatures, SSTs and snow cover. I do not have time to produce a long report but I'll make brief comments below each chart. Please note that some of the regular charts are not available at the time of this report (for various reasons, including the past shutdown access problems) but I found acceptable substitutes. Current ice extent is running well below the 1981-2010 30 year mean (more later). The large beige area (which includes the area around the pole that is not showing up properly on this chart) has the thickest ice - over 50 cms. 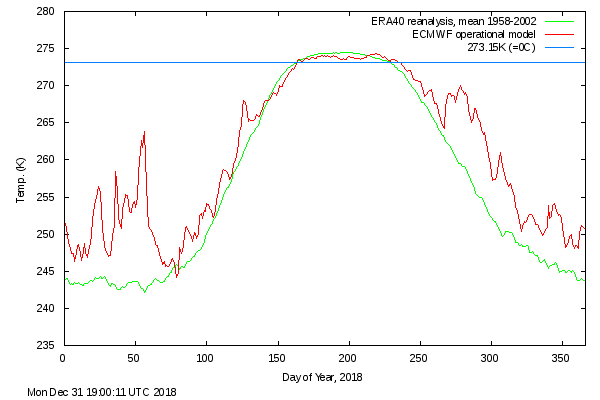 2018-19 ice extent is running well below quartile mean and slightly below the decadal mean (more later). It is currently around the 4th lowest on record for early February. This charts shows the ice extent for each January since the start of the satellite recording era in 1979. 2019 is well above the last 2 Januarys. Just above 2004, slightly below the current decadal average and well below the 1980s, 1990s and 2000s decadal means. This chart is from the excellent Zach Labe website (all links are shown in my introductory post to this thread). Zach is expanding his site steadily and it's well worth a visit. Arctic surface temps have been generally lower than in the last few years (more below). In fact January 2019 finished well below the 30 year mean with overall Arctic Ocean 2m surface temps nearly 1c below and the whole Arctic region (north of 66N) just over 1c below. This month to date sees the region continuing over 1c below the 30 year mean, although the ocean 2m temps are only slightly below the mean. In fact January 2019 is ranked the 17th coldest out of all 40 Januarys and the coldest since 2004 in stark contrast to some recent years. It is easy to see why the ice extent is struggling to expand despite the below average 2m temps. 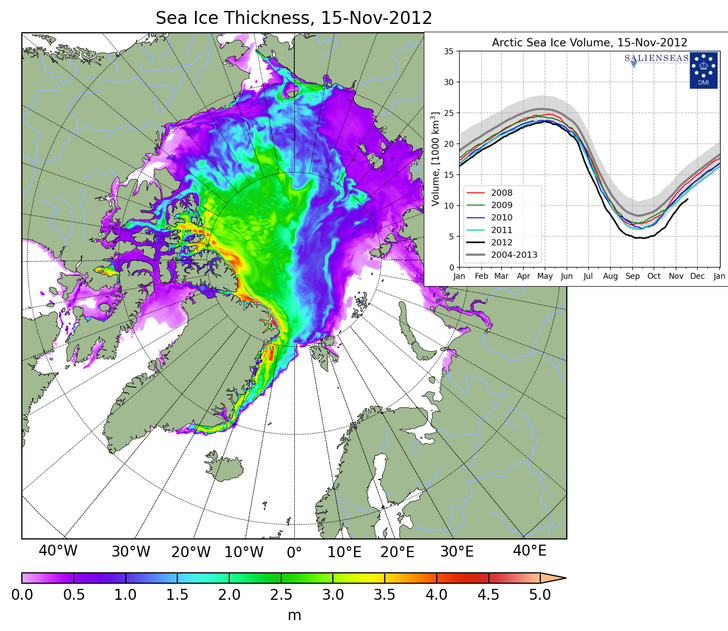 The white area is the ice sheet and the SSTs quickly rise to 3c to 5c just beyond it. Nevertheless, should the temps continue to be near to or below the 30 year mean, then further reasonable ice expansion is probable during February and into March. Further good news is that the SST anomalies in the open waters are generally running at 1c to 3c above the "1971-2000" 30 year mean (which would be even closer to the 1981-2010 mean - not used by ClimateReanalyzer). The last 3 winters saw wide areas over 4c above the mean and some spots nearer 6c to 8c above. So, 2018/19 SST anomalies are trending down from their extremely high levels - a long term legacy from the 2015 super El Nino. The full access to the NOAA snow data is not available but I obtained this N Hem comparison chart. Snow cover is currently running at a similar level to this time last year and around the longer term mean. Slightly below in CONUS and very slightly above in central Asia. The snow extent increased markedly through March 2018 to substantially above average following the SSW impacts then. Will we see a repeat this year? Arctic sea ice extent for January averaged 13.56 million square kilometers (5.24 million square miles). This was 860,000 square kilometers (332,000 square miles) below the 1981 to 2010 long-term average sea ice extent, and 500,000 square kilometers (193,000 square miles) above the record low for the month set in January 2018. January 2019 was the sixth lowest January extent in the 1979 to 2019 satellite record. The average rate of daily ice growth of 51,200 square kilometers (19,800 square miles) was faster than the long-term average. Ice growth primarily occurred in the Bering Sea and Sea of Okhotsk in the Pacific sector as well as in the Labrador and Kara Seas. Some ice spread to the northeast of Svalbard, while retreating slightly to the northwest of these islands. Total ice extent was tracking at eighth lowest on January 31, with below average extent in nearly all sectors of the Arctic.